Warning this is a fangirl's post :P Mark Caguioa ended the last conference with a good and bad bang! His performance for the entire conference was recognized when he received his 2nd (..just the 2nd!!!!) Best player of the conference award. The last time he won the BPC award, was in 2006-2007 season, he was the biggest contender for MVP but..ok that's an entirely different story. Fast forward Commissioner's cup 2012, he had a freak accident that made him sit through the semis and its kinda sad to say that although it proved that he's the most valuable player but also where the Spark goes, Ginebra goes. With Mark on the bench, Ginebra got eliminated by the eventual champions B-Meg. To say that he embodies Ginebra's Never Say Attitude is an understatement. He's been playing for more than 10 years now and even after different injuries or setbacks, he manages to come back strong each time. You wouldn't think that his health was even questionable before the 2012 Governor's cup opened, they are currently 3-2--> almost 4-0 so far. In Ginebra's first game versus Air21, this marked Caguioa's, with protective glasses, grand return with a good support from all around import Cedric Bozeman with 29points and 13 rebounds. This runaway win also featured the rookie Allein Maliksi who recovered from a ligament injury. When Ginebra got the Espana Express, between the 2 of them, I was rooting for Dylan Ababou to stand out but if we can have both, that's great news! I have high expectations from Dylan because I watched him became UAAP MVP. I can say that I havent tracked Maliksi's career, he was Dylan's backup in their UST Tigers stint but while the former was on the talent studded Smart Gilas, Maliksi became a PBA D-League MVP. The biggest story on Ginebra's loss to BMeg is the "benching" of super rookie Ababou. Maybe coach Siot's reason of not using Ababou for defensive purposes will be acceptable if they actually won. But they didnt and that sparked anger online. I often feel bad for Ababou, he had a stellar UAAP career, but his playing time - note: his playing time not his talent - went downhill when he joined the Smart Gilas national team. Then he got drafted #10 by Barako Bull. Ok, so teams passed on him but that didnt stop him from showing moments of brilliance when he got his well deserved playing time. It was enough brilliance to get Ginebra interested. The Spark is Back. That is the theme for Ginebra's 3rd game against Meralco Volts. Out of town games are Ginebra's forte no doubt plus Mark Cardona was missing! Caguioa took charge on the 3rd quarter, Maliksi had a career high 16 points, good game from Bozeman & Cortez plus Rico Maierhoffer had a breakout defensive game. As they say, he is the poorman's Sakuragi because he gives a different energy from his rebounds, hustle play - I'll take it! Ouch Paul Lee. 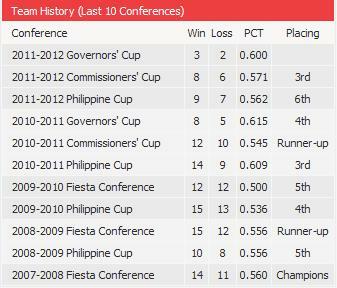 The loss versus ROS is one of those losses when you can't really blame anybody because its very winnable. They played excellent defense on the current #1 team but the import Cornley & super rookie Paul Lee made the shots during crunch time. Not an ideal win vs Petron - but I'll take it. 6 minutes remaining in the 4th quarter, Petron is in control with a 9 point lead then Mark Caguioa happened. He provided the much needed spark after sitting on the bench for half of the last quarter BUT the other key factors are Dylan's defense to Lutz, the old school Kerby Raymundo is back, Maierhoffer's hustle and Bozeman's consistency. But I also noticed - what is happening with Jayjay and Mike Cortez? Are they losing rhythm because they're sharing their minutes with the import? The good problem. I think each team in the PBA have loaded line ups because of the limited number of teams so coach Siot shares this problem with 9 other coaches. The only difference is its magnified because of the multitude of Ginebra fans plus the social networks allow them/us to voice our opinions on coaching style, player rotations. But in the end, we have the same goal = Ginebra's success. As I said, I really like the current mix of veteran and rookies, Maliksi, Ababou, Wilson and Maierhoffer are gems for the future. I can see a bright future with the four as core of the team. For the present, the best 5 are Caguioa, Ababou/Maliksi, Hatfield, Bozeman and Raymundo. 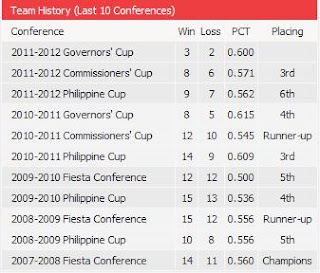 I think this conference and/or the All Filipino cup next season is the best time time to win a championship. Let's face it, the Caguioa-Helterbrand-Menk-Hatfield era are nearing its tail end. Maybe they can still play for 3-4 years but their competitive years, enough to win a championship, is ASAP! Ginebra fans would be really happy if their performance will continue to the finals. Fans also have a great support when Ginebra has a game.